Capoeira! It’s a game! It’s a dance! It’s a martial art! It’s a way of expressing yourself through acrobatic movements and pounding, rhythmic music! From its historical beginnings in Brazil to today’s capoeira academies, capoeira is quickly becoming a worldwide phenomenon. George Ancona, author and photographer of the book, shares some of his stories about capoeira and how he discovered the game. 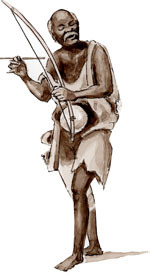 The first time Ancona saw capoeira being played, he was on a street in Salvador, Bahia. “Forty years ago I was on assignment, doing a film documentary about Brazil,” the author remembers. “I was filming in the streets when I heard unusual music coming from the middle of a crowd of people.” What Ancona saw was two young men leaping and kicking at each other to the musical accompaniment of a cluster of musicians. “They were singing and playing berimbaus, pandeiros and other percussion instruments,” says Ancona. The author says he has always been very impressed and sometimes even surprised by capoeira. “I was impressed with the joy in the expressions of the children as they played what could be a deadly game,” Ancona comments. “I was also surprised by the sense of responsibility, respect, and discipline that existed in every academy I visited. When playing capoeira, one becomes very aware of one’s self in relationship to what’s around you. It’s very interesting to see this in young people.” Capoeira has the unique ability to celebrate both togetherness and individuality. “Capoeira is amazing. Each group or academy becomes a family, and each person is celebrated for his or her individuality. Each student, master, and teacher is given a nickname that points out something unique about that person.” Capoeira began as a way for African slaves in Brazil to fight for their freedom and independence. Ancona says, “I would like for readers to know that these skills are not just for fighting. They can be turned into a means of expression, an art form that celebrates and respects the differences among us.” George Ancona lives with his wife in Santa Fe, New Mexico.